Bovie high-temperature non-sterile fine-tip cautery tip. Replacement for Change-a-Tip handles. Sold 10 per box. Bovie low-temperature non-sterile fine-tip cautery tip. Replacement for Change-a-Tip handles. Sold 10 per box. 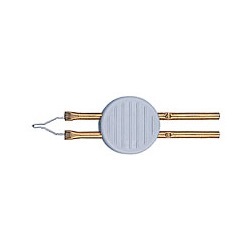 Bovie high-temperature non-sterile loop-tip cautery tip. Replacement for Change-a-Tip handles. Sold 10 per box. Bovie low-temperature handle that includes one fine-tip non-sterile tip and one "AA" alkaline battery. Sold 1 per box. Bovie high-temperature handle that includes one fine-tip non-sterile tip and one "AA" alkaline battery. Sold 1 per box.